The former RAF navigator never managed to escape the camp in events later portrayed in the Steve McQueen film. WORLD WAR TWO veteran Jack Lyon, one of the last veterans of the famous ‘Great Escape’, has died at the age of 101. The former RAF navigator passed away at his home in Bexhill-on-Sea on Friday, according to the BBC. Lyon was the lookout during the breakout attempt from the Stalag Luft III POW camp in 1944, which was later made into a film starring Steve McQueen in 1963. However, the escape tunnel was uncovered before Lyon had a chance to escape the camp himself, which he said was likely to have saved his life. 50 of the 76 prisoners who escaped from the camp were executed on the orders of Adolf Hitler. “Had I got out, I probably wouldn’t be talking to you because my chances of getting home were virtually nil. I was under no illusions about that,” Lyon told the BBC on his 100th birthday in 2017. He also described the Hollywood portrayal of events as “absolute rubbish”, saying “not one American” took part in the escape and that the motorbike used by Steve McQueen in the film “never existed”. RAFBF chief executive Air Vice Marshal David Murray also told BBC that Lyon “belonged to a generation of servicemen” that were sadly being lost as time went on. “His legacy and those of his brave comrades who planned and took part in the audacious Great Escape breakout, are the freedoms we enjoy today,” Murray said. Email “'Great Escape' veteran who called film 'absolute rubbish' dies aged 101”. 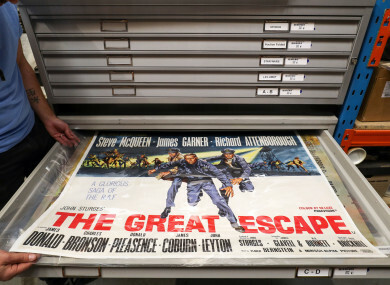 Feedback on “'Great Escape' veteran who called film 'absolute rubbish' dies aged 101”.